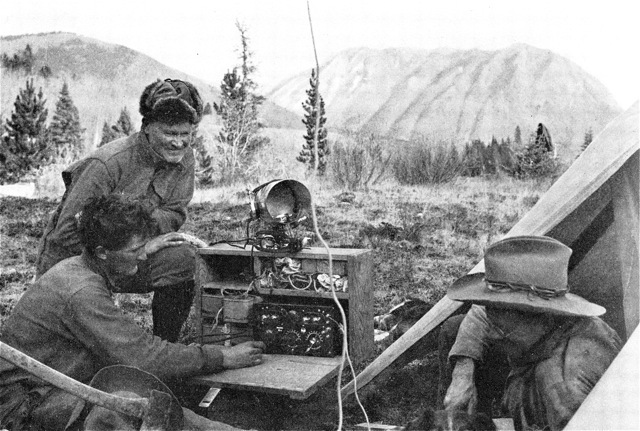 Lewis Freeman and packers with a shortwave radio during the 1924 Columbia Icefield expedition. The party hauled the radio on a packhorse and successfully tuned in opera from San Francisco and the World Series. It is the earliest example of technology compromising the wilderness experience. I was working for Parks Canada at Lake Louise in 1994 when a phone call arrived at the Visitor Centre. A climber on the summit of Mount Temple was calling in to say he was running late and wouldn’t be checking in from his climb until later in the evening. I suppose we should have cheered the new technology that allowed climbers to inform us when they were safe or in trouble. But mostly we were rolling our eyes—someone was showing off with his cell phone. It was foreshadowing of things to come. Fast forward 20 years and the backcountry has experienced a tech explosion: GPS units loaded with topo maps that also read distance travelled and altitude; two-way radios with Bluetooth headsets that allow everyone in the party to be constantly connected; pocket-sized digital cameras that can take hundreds of photos or high-definition video; GPS sport watches that tell the time, your location, distance travelled, heart rate and calories burned. When we started our career on the trails, it was the era of no-tech, unless you consider the battery that powered the light meter in our camera. But even then, the camera still operated even if the battery failed. When we set out to write the Canadian Rockies Trail Guide, we pushed standard 27-inch bicycle wheels with mechanical odometers attached to a spoke on the wheel (one click per rotation). When cyclists went digital, we switched over to the new odometers. Unfortunately, they were no more accurate than the mechanical ones, you had to worry about batteries dying, they had to be recalibrated when batteries were replaced, and they were very easily shut off by a passing branch or when you rested the wheel on the ground. Our trail notes used to be entered in small pocket-sized notebooks. But then came the micro-cassette recorder, which made note-taking much easier (but once again required batteries). And after that the mini-digital pocket recorder, which was even smaller and lighter. But the small controls are a bugger to operate, they need a USB connection to power internal batteries, and are always disappearing in your pack. We also started carrying GPS units a few years back, not because we feared getting lost or found the internal maps useful, but because of their decent accuracy for distance and altitude. And to record latitude and longitude for trail heads and points of interest, knowing full-well that many trail guide readers were using GPS units. And I dread the day when I see a hiker on the trail, plugged into his iPad, listening to music and following the trail ahead on Google Street View. Makes one long for the days when you had no distractions except for the clouds building up on the peaks or worrying that there might be a grizzly around the next bend in the trail. But who knows, maybe we’ll regain sanity and realize that our technology is getting between us and the mountains. 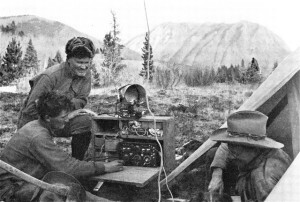 After all, no one has taken a shortwave radio into the backcountry since Lewis Freeman in 1924.